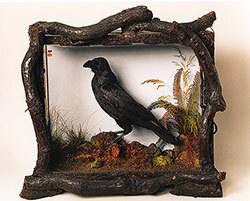 Grip, pet raven of Charles Dickens, though to be the inspiration for Edgar Allan Poe's "The Raven." Provenance: At the sale held a month after Dickens death in June of 1870 by Christie, Manson and Woods, Grip was purchased for 126 pounds ($630) by G.S. Nottage, head of the London Stereographic Company and later Lord Mayor of London. After the death of Nottage his wife sold the raven, in 1885, to the famous Dickens collector, Dr. R.T. Rupp. At the sale of Rupp's collection in 1922 the raven became the property of Newbury Frost Read of New York, at whose death it was sold to Richard Gimbel. Colonel Gimbel donated Grip to the Free Library in 1970, along with his Edgar Allan Poe collection. (1959). "'Quoth the Raven': An Exhibition of the Work of Edgar Allan Poe Held in the Yale University Library to Commemorate the 150th Anniversay of His Birth 19 January 1809." The Yale University Library Gazette, 33(4).